It’s got to be my husband and I’s favorite dessert. We are both so bad. We can possibly gorge down a whole container of ice cream in one sitting… if we don’t control ourselves. But I’m glad to say that it hasn’t happened yet, not so far anyways. Hahhaha.. Not that we are planning on doing it anytime soon, or ever. God forbid. But I got to say, I’ve never had this much ice cream indulgement until I came to the US. In the Philippines, ice cream is more of an occassional treat for most families, so I’ve never really enjoyed a lot of it when I was growing up (except for the local ice-cream from the push-cart being sold in the street, which is more like a sherbet actually). But everything changed a bit when I started working. Ice cream became a familiar treat to my palate, as it was present on every birthday celebration there was in my office. That and cake. Couldn’t be badder (yeah, i know, wrong grammar), but couldn’ be better at the same time (now you know, I wanted my words to rhyme!). Ice cream and cake is the yin and yang of every birthday celebration, in my opinion. One is not the same withouth the other. Anyways, back to my advent in the US. Imagine my delight in discoving the BUY ONE, TAKE ONE deals in the groceries for ice cream! Sweet!!! (Yeah, literally) My ice-cream starved pysche dictated that I should buy everytime there was a sale, so I began hoarding them in my fridge. Actually, I’m over exaggerating… but I was buying them more often than I should. But don’t worry. I’m over that stage now (though I admit buy-one-take-one ice cream is still pretty hard to resist sometimes). Since summer is here, cool treats are in! And so, to celebrate my love for this frozen dessert, and to surprise Mr. J with something a little special, I made a tulipe – which is actually a hazelnut cookie curl. I really do think that the addition of finely ground hazelnut made the cookie extra special. This was my first time to try doing this, so I was proceeding with caution. Yeah, some cookies did not come out successfully, but I did manage to get 4 good tulipes out of the 6 that I made. Pretty good for a first try, don’t you think? 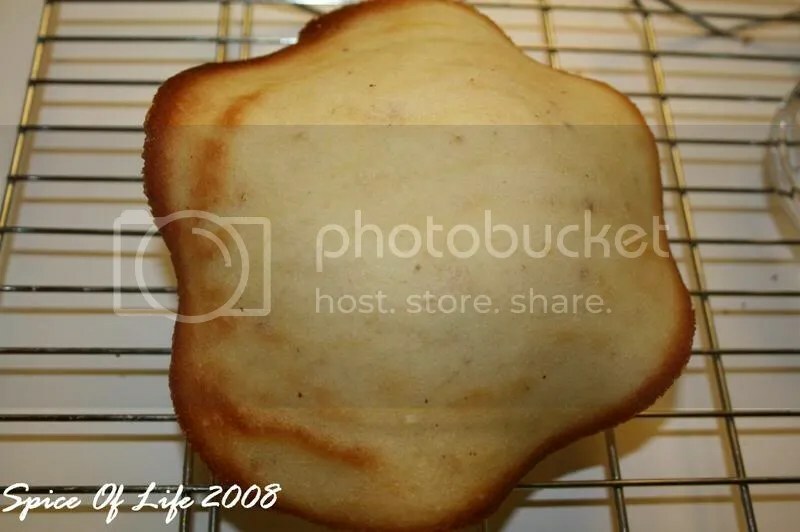 Next time though, I’ll make it a point to follow the instructions to the T. I thought that the amount of the batter required for the cookie was too little that I doubled it. That was a major mistake. For the tulipe to be pliable, it has to be as thin as possible; mine came out a tiny bit thicker. Also, I chose to leave it a few minutes longer in the oven than called for, because I wanted crispier edges.. So as you can see, they are short of being burnt! The ice cream is, of course, store bought. I have yet to try making a homemade one, when I get my ice cream maker that is. The recipe recommended vanilla ice cream, but I decided that Neapolitan is more exciting with its three different flavors. Oh, the raspberry sauce is also homemade. Initially, I thought of doing a chocolate ganache for drizzling on top, but the dessert is already rich as it is, so I decided to go with the fruit puree instead. As you can see, the presentation came out elegant. 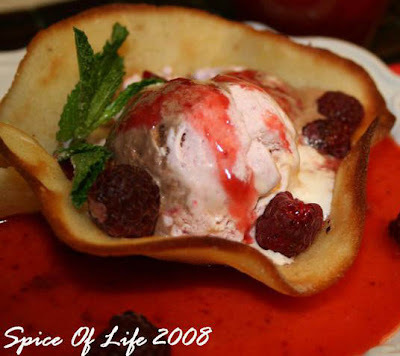 The tulipe surrounds a mound of ice cream in a crunchy embrace while it rests on a pool of raspberry sauce. No wonder the hubby exclaimed, “OOOH!”. 1. Pre-heat oven to 350F. In a shallow pan, bake hazelnuts 10-15 mins or until skins crack. Remove from oven; wrap in towel. When cool enough to handle, roll nuts in towel to remove as much skin as possible. Let cool; finely chop cooled nuts in food processor or blender. 2. Pre-heat oven to 400F. Grease and flour three large baking sheets. In a small saucepan, melt butter; cool. In a small bowl, whisk egg whites with 1/2 cup sugar, the salt and rum extract until foamy. Whisk in melter butter, then flour. Add nuts. 3. 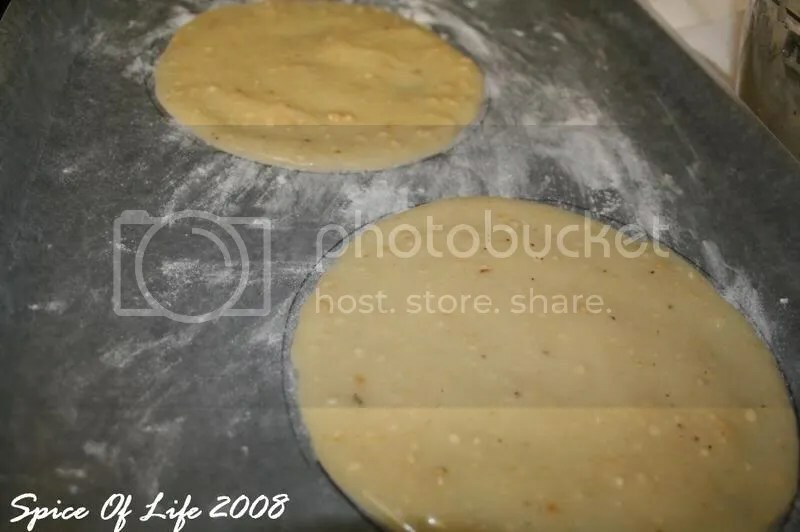 Use the rim of a glass to make two 5-in circles on prepared baking sheets. (I made the marks at the back of the parchment paper). Spoon 2 level tablespoons batter onto each circle. Spread evenly to fill circle. Bake 5 minutes or until edges are brown. Spray the bottoms of six 6-oz custard cups with non stick cooking spray. 4. Using pancake turner, lift cookies from baking sheets; invert onto greased bottoms of custard cups. With fingers, gently mold around cup. If cookies are too brittle, reheat briefly in oven. Cool tulipes completely on wire rack; then lift tulipes off cups and place on wire racks. 5. Make raspberry sauce. Combine thawed raspberries and 1/2 cup sugar; let stand 20-30 mins. Using back of large spoon, press berries and any juice through a strainer set over a large deep bowl until only seeds remain; discard seeds. 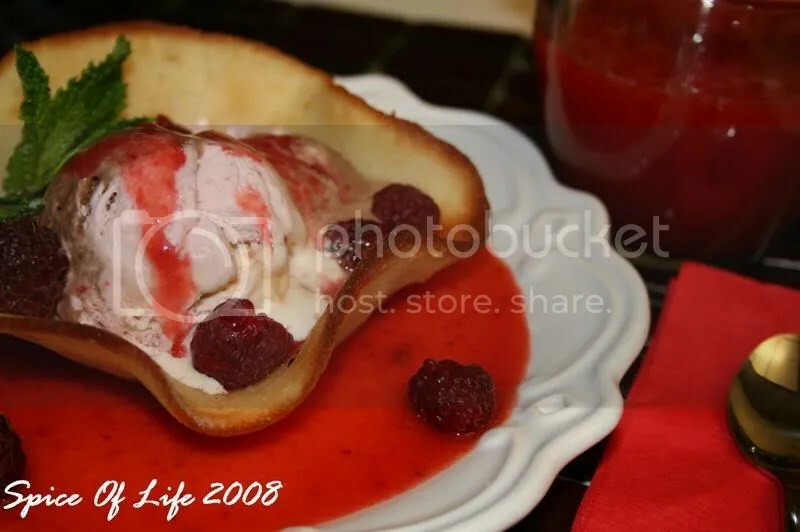 Cover raspberry puree and refrigerate until serving. NOTE: I did not have rum extract, so I used coconut rum instead, and it worked! If you don’t have hazelnuts, you may use toasted almonds. In this case, Amarretto Liqueur might be good to use since it’s almond-flavored. 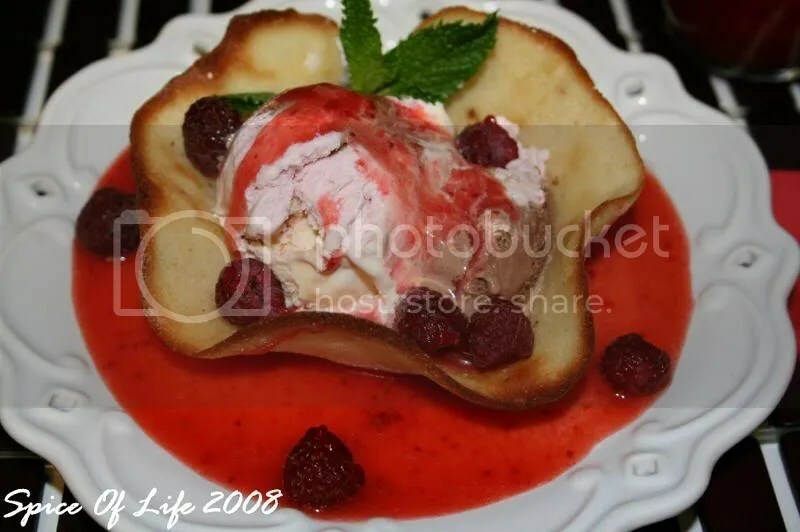 Also, you can use strawberries for the sauce in place of raspberries. The puree can be made ahead and will keep in the fridge for a couple of days. For a lighter alternative, you can fill tulipe with a low-fat frozen yoghurt. Or, you can fill the bowl with slices of fresh tropical fruit such as mango, kiwi, pineapple and papaya; top with vanilla yoghurt. this looks and sounds amazing. i absolutely love the cookie bowl–very clever! Thank you Grace. It tastes so good too! Wow. That looks amazing. I really like the shaping method for those little edible cups. I think everyone said it all ready, but I’ll say it again…this really does look amazing! This is ice cream at it’s best! Beautiful! Wow. Cute cute cute. I have been thinking and dreaming in my little head about some kind of “cup” for ice cream treat. I was wondering about crisping a crepe somehow, but this seems like a much better solution! that looks really nice. the oozy cream… YUM! thanks,everyone… it was indeed, good! i’ll be making it again, fo’ sure!